During WWII many wealthy Parisians left the city and fled to suburbs and neighboring countries and after the city was liberated in 1944, the general feeling of pessimism and defeat lingered. Rations, protests, and war-torn facades left many Parisians feeling ashamed and ready for a new era in the city. With fashion houses like Dior creating a “New Look” that emphasised Haute Couture (1950s Paris) and photographers and directors following their lead (think Audrey Hepburn movies like Funny Face), Paris kept its title of a fashion capital. Architects of the time wanted to create something modern, streamlined and often inspired by the advances in technology and transportation. The epicenter of this move towards modernism can be found at La Defense. La Defense, the Paris business district, is home to the first skyscrapers in Paris which were built in in the early 1960s. The first skyscraper was the Nobel Tower which was constructed in 1966. With the creation of the RER, more businesses, schools and conventions had incentive to buy space in the area. Despite a financial crisis in the mid to late 1970s, La Defense continued to be built and leased with transportation to the area improving vastly under the direction of EPAD, or Public Establishment for Installation of La Defense. Another major project created during this era was Centre Pompidou (1977). The Prime Minister at the time, Georges Pompidou (1962-1968), ordered that the Beaubourg center was rebuilt into the Centre Pompidou. The Beaubourg district of Paris is just adjacent to Hotel De Ville or the 4th arrondissement. The project was headed by famous architects, Renzo Piano and Richard Rogers and is famous for the “exo-skeleton” form. Centre Pompidou’s exposed piping and elevator and bright colors stood out as a new national monument and in its first year surpassed the Eiffel Tower in number of visitors. Despite critics comparing it to an oil factory and criticizing the stark contrast between the center and its surrounding streets, it was a step into the future for Paris. Centre Pompidou was a message to the world that Paris was not only a fashion and arts capital, but also a business capital with the ability to modernize despite being revered for its classical architecture. President François Mitterand (in office 1981-1995) set out to begin the “Grand Travaux” a project aiming on creating modern monuments in the city. The big plan began in 1982 and President Mitterand wanted eight new monuments to be a symbol of Paris-post WWII progress and a move forward culturally. 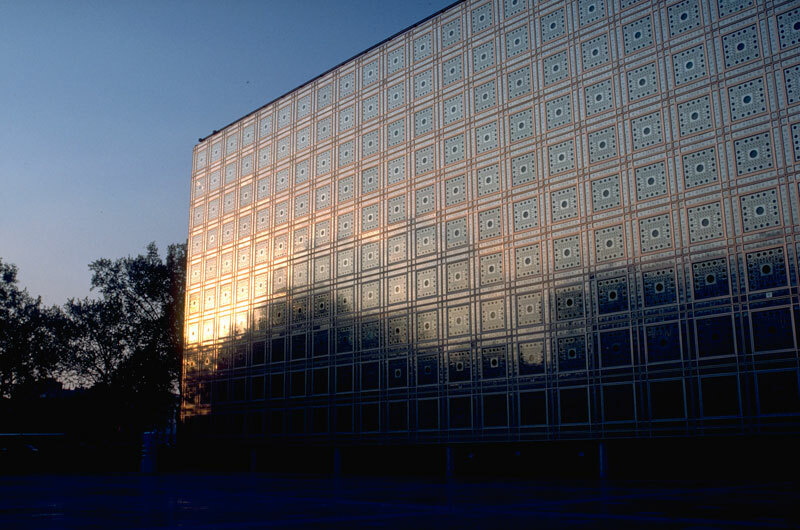 The new monuments included: Parc de Villette, Musee D’Orsay, Arab World Institute, the Louvre Pyramid, Opera Bastille, Ministry of Finance, Bibliotheque Nationale de France and the Grand Arche de La Defense. These buildings all were built with material that focused on reliability and transparency while showing France’s progress over the years. This was one of the most expensive projects in modern French history and was received with mixed reviews. The Paris of today is somewhat of a mixed bag of both traditional Haussmann and modern style buildings. Because Haussmann style was built for nobility and upper-class and modern-style was generally built to house larger working-class populations, these two types often remain apart from each other. Much of Parisian architecture is a flip flopping between being inspired by more traditional, Roman and Greek style architecture and then revolting against tradition for a modern approach. Wanting Paris to be shown globally as a major city renowned not just for its arts, music or fun but also for its architecture, has been a platform for most former leaders.